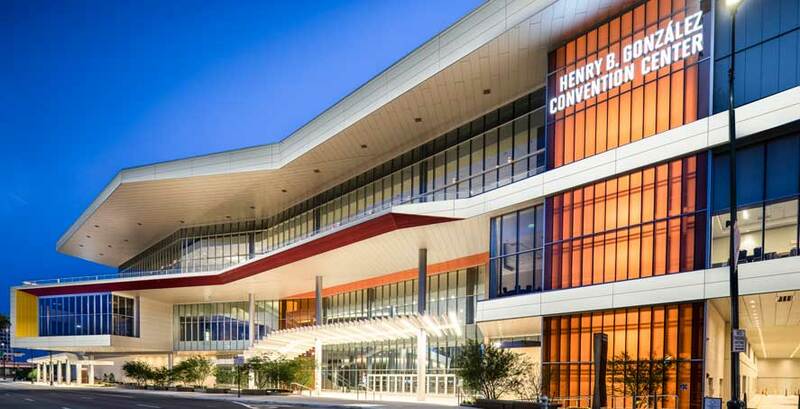 The Henry B. González Convention Center is nestled in the heart of historic downtown San Antonio, along the banks of the world famous River Walk. The facility is the central component of the city's successful convention industry. The Center, named for the late U.S. Congressman Henry B. González, hosts more than 300 events each year with over 750,000 convention delegates from around the world. Rate: $12.00 first hour with $5.00 each additional hour up to $31.00 maximum per day. Closest parking to Convention Center. Across street from main entrance to Convention Center. Rate: Weekdays Monday - Thursday $3.00 per hour up to $30.00. Weekends Friday - Sunday $5.00 per hour up to $30.00. Take Highway 281 South to the East Cesar E. Chavez Boulevard exit. Exit on East Cesar E. Chavez Boulevard and turn right on East Cesar E. Chavez Boulevard to Alamo Street. Turn right on Alamo to Market Street. At Market Street turn right and proceed in front of the Convention Center. Just before the stoplight at Bowie Street, the Convention Center Garage is on the left (past Marriott Riverwalk) and the Grand Hyatt Parking Garage is on the right. Travel IH-35 South to San Antonio. IH-35 South intersects with IH-37 South to Corpus Christi. Take IH 37 South to the East Cesar E. Chavez Boulevard exit. Exit on East Cesar E. Chavez Boulevard and turn right on East Cesar E. Chavez Boulevard to Alamo Street. Turn right on Alamo to Market Street. At Market Street turn right and proceed in front of the Convention Center. Just before the stoplight at Bowie Street, the Convention Center Garage is on the left (past Marriott Riverwalk) and the Grand Hyatt Parking Garage is on the right. Travel IH 10 West to San Antonio. IH 10 West intersects with IH 37 North toward Johnson City. Take IH 37 North to the East Cesar E. Chavez Boulevard exit. Exit on East Cesar E. Chavez Boulevard and turn left on East Cesar E. Chavez Boulevard under the interstate to Alamo Street. Turn right on Alamo to Market Street. At Market Street turn right and proceed in front of the Convention Center. Just before the stoplight at Bowie Street, the Convention Center Garage is on the left (past Marriott Riverwalk) and the Grand Hyatt Parking Garage is on the right. Travel IH 37 North toward San Antonio to the East Cesar E. Chavez Boulevard exit. Exit on East Cesar E. Chavez Boulevard and turn left on East Cesar E. Chavez Boulevard under the interstate to Alamo Street. Turn right on Alamo to Market Street. At Market Street turn right and proceed in front of the Convention Center. Just before the stoplight at Bowie Street, the Convention Center Garage is on the left (past Marriott Riverwalk) and the Grand Hyatt Parking Garage is on the right. Travel IH 10 East toward San Antonio. IH 10 East intersects with IH 35 South toward Laredo. Take IH 35 South to the East Cesar E. Chavez Boulevard exit. Exit on East Cesar E. Chavez Boulevard, keep right for three-quarters of a circle and proceed under the interstate past six traffic signals to Alamo Street. Turn left on Alamo Street to Market Street. At Market Street turn right and proceed in front of the Convention Center. Just before the stoplight at Bowie Street, the Convention Center Garage is on the left (past Marriott Riverwalk) and the Grand Hyatt Parking Garage is on the right.